Do you ever have towels that smell musty no matter how much you wash them or how much snuggly clean, mountain fresh, or floral fabric softener you use? I just found the solution! One wash with vinegar instead of detergent (and omit fabric softener) can do the trick! This brought life back to our fluffy towels because, finally, they do not stink anymore. I was about to purchase new towels so my 99-cent bottle of white vinegar saved us some cash too. Do you use vinegar for cleaning at home? You should! Vinegar is one of the most useful items in my pantry. It's not just for salad dressing and dyeing Easter eggs anymore! (1) Floor cleaner - if you have tile or hardwood floors, you can mop them with watered-down white vinegar. It works just as well as store-bought floor cleaners and it's super easy and inexpensive. (2) Bath and shower scum remover - A white vinegar scrub can remove stubborn film around the bathtub from grimy kids. You can also get the scum out of shower door tracks/frame by letting some vinegar sit in the grooves for several minutes, then rinsing out. (3) Removing smells from laundry - As mentioned above, one wash with a cup of white vinegar in the washing machine (instead of detergent and with no fabric softener) can get hard-to-remove mildew odors from fluffy towels. After the vinegar wash, restart another cycle using detergent and softener as usual. Speaking of laundry, a rinse in vinegar can also remove detergent residue that can dull black clothing items. (4) Clean tarnished metals - Vinegar and salt (or a paste made with equal parts vinegar, salt, and flour) can remove tarnish from pewter and brass. Even silver jewelry and flatware can be cleaned from items in your pantry. Place one tablespoon each of salt and baking soda in a large bowl or baking dish lined with aluminum foil, shiny side up. Boil one cup of water. While that is heating, line silver items up in the bowl/pan so that they are touching the foil. Add 1/2 cup of vinegar and the cup of boiling water to the bowl/pan. The bubbly reaction will clean the items to a nice shine. (5) Take off stubborn coffee stains - Coffee cups that are stained from coffee and tea can be made shiny and white again with a scrub of equal parts vinegar and salt - or equal parts vinegar and baking soda. It's cold and wintry right now as I write this... but keep vinegar on hand when spring cleaning time comes around. 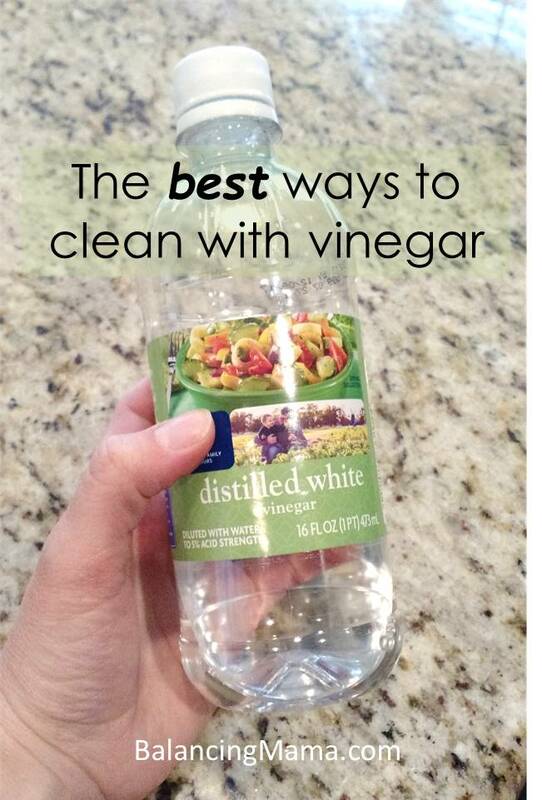 Do you have other cleaning uses for vinegar? Let us know!